So, you have finally met the girl of your dreams. The one who cooks your favorite meals. The one who orders your usual drink at the local Starbucks. The one who tries her darndest to please you and hey! The one who even knows your favorite soccer team. And you’re finally ready to settle down and find a suitable partner to help navigate the horrors of lifelong loneliness and the incessant “bila nak kahwin?” questions from your older relatives. You’ve already planned the most romantic proposal to pop the question. But now what? All those Malay dramas she forced you to watch barely described the Malay wedding process, and you have no idea where to start! No worries! 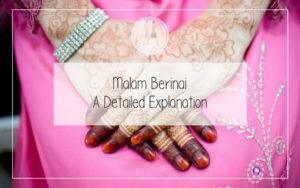 This article will help explain the technical aspects of the whole Malay wedding process. 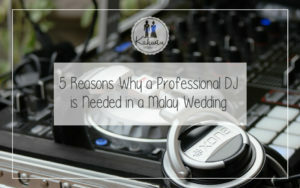 From the important pre-wedding customs to the ceremony itself. So what do you say? Are you ready to take the plunge? Although the Marriage Preparation Course is no longer compulsory in Singapore (as of 2015). Couples (especially young couples) are still highly encouraged to register and attend the short class. The short two-day course is usually held at the local mosque, Islamic center and sometimes come free as part of your wedding package, depending on the company. You’d be surprised to note that the prep program isn’t all too bad. If anything you’d be learning a few wedding hacks to keeping your married lives happy and secure. Future in-law relationship tips, to name a few. The number one factor in ensuring whether or not you’ll pass the course is your attendance. Ensure that the class scheduled is not clashing with your work schedule or any personal events you have planned. Engagement parties are traditionally used as a ‘tanda persetujuan’; to let people know that you’re basically “off the market” and engaged to be married. 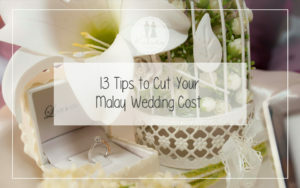 The ceremony itself is optional but for those who are serious about marrying their significant other (or who want to ‘chope’ their partner as soon as possible haha), then you should consider holding a small engagement ceremony. For those in the background groaning about the additional costs. You should note that engagement ceremonies are often small, intimate affairs that can be held at your house with a relatively low budget. When the both of you are mentally and financially ready to take the plunge, it is time to consider registering your wedding. Unlike the wedding prep course, registering your marriage is compulsory. Muslim couples are advised to register their future wedding with the ‘Registration of Muslim Marriages,’ a.k.a. ROMM. The process is relatively simple and can be done online unless the potential bride does not have a wali. Couples without a wali would have to register their marriage along with the bride’s mother at the ROMM building themselves. The amount of information needed might seem daunting and super scary, but preparing a spreadsheet or word document beforehand with all the needed info will make everything easier. It took me about ten minutes on my trial run when prepared and around twenty minutes to fill everything in, unprepared. Seriously, if someone as blur as me finds the process to be simple, I’m sure you will too. Okay, before you run out of your bedroom screaming “apasal la nak kahwin pun kena banyak steps? They never showed all this in those Malay dramas!” I know I did. But don’t worry dude, the wedding interview is, for the most part, a simple, casual affair. You will be asked simple questions about whether or not you were forced into the marriage (for women) and if you’re actually prepared for marriage. And both bride and groom will be asked to take an oath, promising that they are indeed prepared to wed their partner. If the idea of an interview still sends shivers down your spine. Well, don’t worry. We’ve included a list of possible questions asked (sourced from reading many websites). Are you forced into the marriage? Are there any major problems in the relationship? Have you’ve attended any religious (Muslim) classes as a child/teenager? Although there might be other potentially religious questions for you to answer. I can assure you that it’s not challenging and is for the most part based on common sense. Keep in mind that the interviewers are not going to punish you for any wrong answers. At most, you will be advised to read through your Islamic books before the ceremony. Also, despite the rumors, they’re not going to make you recite parts of the Quran to determine whether or not you’re ready to get married. I promise. Dress modestly for the interview, and it is advisable to cover up and remove any visible tattoos or piercings. Men should also avoid wearing gold jewelry. Appearing tactful will make the interview process easier. Like any other wedding ceremony, the process is expedited and begins with the solemnisation. In Singapore, Malay wedding solemnization usually takes place at the ROMM (Registration of Muslim Marriages) building. During the Akad Nikah, the groom will be asked if he is ready to take on the bride to be, his lawfully wedded wife and upon verbal agreement. Both bride and groom will be pronounced husband and wife by the Kadi. There are 5 Kadis and 22 Naib Kadis in Singapore for you to choose from. Booking of their services can only be done online after you’ve registered your marriage. To find out more about the Kadis, you might want to visit this website. The Kadis usually do not charge for their services, but it is advised for couples to reimbursed their Kadis for their time by inviting them to enjoy the food and drink at the ceremony, their transport money and a small sum of at least $100. As soon as the groom’s solemnisation is proved, to be honest and valid, the kadi pronounces the couple to be husband and wife. And the festivities begin soon after, and on average will last for two days. This ceremony is known in the Malay community as Majlis Persandingan. The term is used to describe the act of (the married couple) sitting right next to each other on the pelamin. The act of bersanding itself might not take place depending on how religious the couple is, due to the spread of Arabisation within the local Malay community. 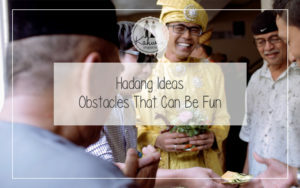 Depending on the couple’s traditional background, performances like the Kuda Kepang, the Kompang and silat will often take place during the wedding ceremony. The wedding ceremony is when guests are invited to partake in the food and drink prepared by the couple. Although it is optional, guests are usually encouraged to donate a small fee to the married couple. At the end of the ceremony, the guest and their children are often gifted with little door gifts and food. And that’s pretty much it! The whole Muslim-Malay wedding process for the average Malay Singaporean! Honestly, though the process might look intimidating when laid out on paper like this. But it isn’t too challenging, and for the most part, it takes place over a span of (at least thirty days), giving the both of you plenty of time to plan the technicalities of your wedding. As always, it is important to remember that if they made the marriage process too complicated, no one in Singapore would get married! My partner and I went for the 2-day course by SPMC. I’m glad we decided not to skip the marriage course because it turned out to be SO GOOD! Informative, a lot of useful takeaways we didn’t think of (and ada romantic moments hahaha). Our lecturer Mr Omar was also really funny. I heard they do 1-day course too.